The discovery of fullerenes and nanotubes has greatly stimulated the interest of scientists and engineers in carbon materials, and has resulted in much scientific research. These materials have provided us with many interesting ideas and potential applications, some of them practical and some simply dreams for the future. In the early 1960s, carbon fibers, glass-like carbons and pyrolytic carbons were developed which were quite different from the carbon materials that had previously been used. Carbon fibers exhibited surprisingly good mechanical properties, glass-like carbons exhibited brittle fracture resulting in a conchoidal fracture surface similar to sodium glass, and giving no carbon dust, and pyrolytic carbons were produced by a new production process of chemical vapour deposition and showed very high anisotropy. These carbons materials made a great impact not only on the carbon community who had been working on carbon materials but also on people working in the fields of materials science and engineering. They were used to develop a variety of new applications in technological fields, such as semiconductors, microelectronics, aerospace and high temperature, etc. These newly developed carbon materials were called NEW CARBONS, in comparison with carbon materials such as artificial graphites represented by graphite electrodes, carbon blacks and activated carbons, which maybe thought of as CLASSICAL CARBONS. Later, other new carbons, such as activated carbons and those with novel functions, isotropic high-density graphites, intercalation compounds, various composites, etc., were developed. 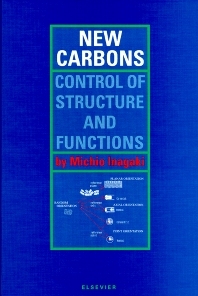 In 1994, Professor Michio Inagaki published a book entitled "New Carbon Materials — Structure and Functions" with his friend Professor Yoshihiro Hishiyama of Musashi Institute of Technology, published by Gihoudou Shuppan in Japanese. However, progress in the fields of these new carbons is so rapid that the previous book is already out of date. For this reason the author has decided to write an English text on New Carbons. The text focuses on New Carbons based on hexagonal networks of carbon-atoms, i.e. graphite-related materials. The fundamental concept underlying this book is that the structure and functions of these materials are principally governed by their texture. The aim is to give readers a comprehensive understanding of New Carbons through the description of their structure and texture, along with the properties that are largely dependent on them. For scientists and engineers in the fields of materials science and engineering, also specifically for all those in the carbon community, working on carbon materials. Chapter and section headings: Old but New Materials: "Carbons". Carbon materials. Carbon family. Purpose of the present book. Characterization techniques for carbon materials. Highly Oriented Graphites. What are highly oriented graphites? Kish graphite. Highly oriented pyrolytic graphite (HOPG). Graphite film derived from polyimides. Isotropic Carbons. Realization of isotropic nature. Isotropic high-density graphites. Glass-like carbons. Carbon Fibers. Classification of carbon fibers. Production. Structure. Properties and applications. Porous Carbons. Formation of pores in carbon materials. Characterization of pores. Control of pores. Applications. Intercalation Compounds. Structural characteristics. Synthesis. Functions related to applications. Carbon Composites. Carbon materials as composites. Carbon fiber reinforced plastics. Carbon fiber reinforced concrete. Carbon/ceramics composites. Carbon fiber/carbon composites. Concluding Remarks. Michio Inagaki is a famous carbon material scientist, who obtained his PhD degree from Nagoya University in 1963. He has worked on carbon materials for more than 50 years. In 2011, he won the Peter A. Thrower Award for Exceptional Contribution to the International Carbon Community.